Step 1 Brown turkey. Add tomato sauce and all spices. Simmer for 15 minutes and let cool. 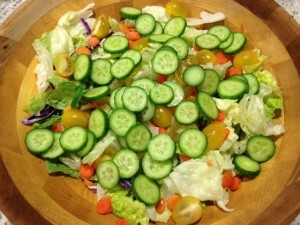 Step 2 Toss lettuce, cucumber, carrots and tomatoes in a large bowl. Step 3 Serve seasoned meat over salad and top with avocado. Step 4 Drizzle with Paleo Salsa as dressing and serve with Paleo Tortilla Chips. Enjoy! Substitute Paleo Salsa instead of tomato sauce for an extra kick of flavor.